siRNA off-target effects takes an interesting turn for cancer research as reported in eLIFE by Putzbach et. al. Research unveiled a specific group of survival genes in cancer cells thanks to the off-target effects of siRNAs/shRNAs. 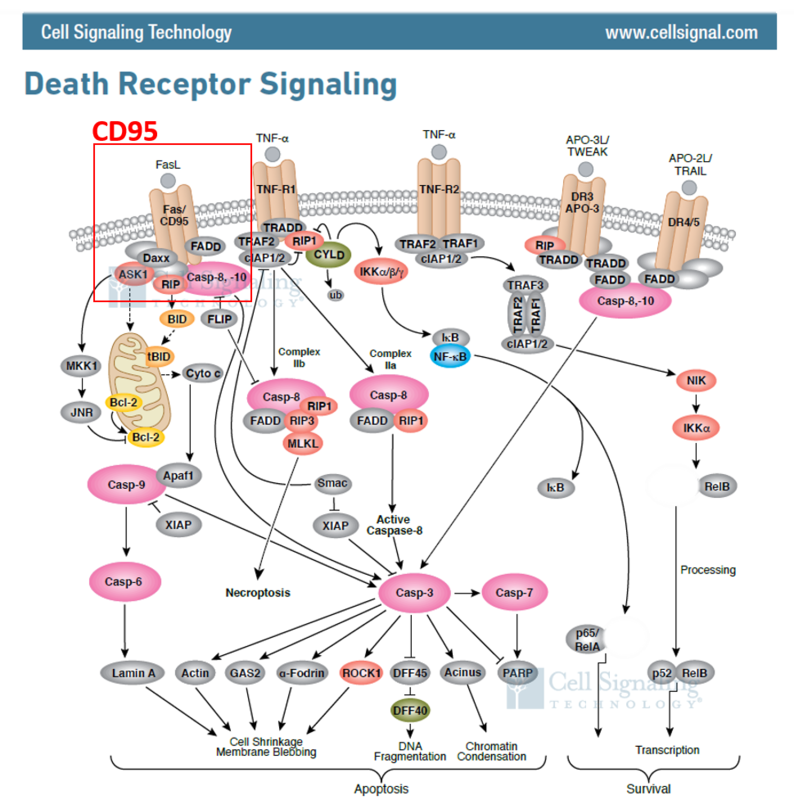 CD95 is a death receptor that mediates apoptosis when bound to its ligand, CD95L or FasL. Known for its multiple tumour-promoting activities, it was not surprising that silencing both molecules by RNAi produced cancer cell death. The evidence was pretty convincing that the toxic effects of the CD95/CD95L siRNA/shRNAs stemmed from off-target effects. It turns out that many of the downregulated genes were important for survival. Additionally, two recent genome-wide lethality screens independently identified six of these genes (highlighted in red). The authors therefore termed this form of CD95/CD95L siRNA/shRNA-induced cell death Death Induced by Survival Gene Elimination (DISE). Don’t we all love acronyms! As depicted, these genes mostly interfered with apoptosis, cell cycle, autophagy and senescence. The seed sequence is what microRNAs (miRNAs) use to recognize and downregulate target genes. siRNAs/shRNAs can behave like miRNAs, contributing to the off-target activity. 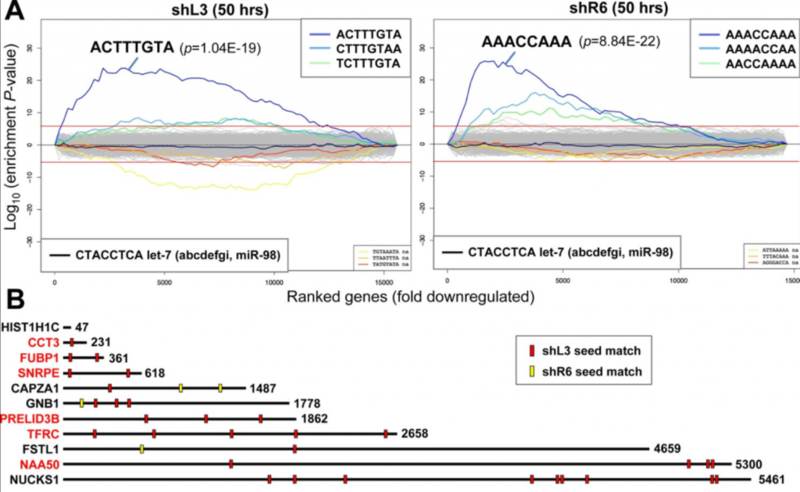 As shown by Sylamer plots, the seed sequence of toxic shRNAs (shL3 and shR6) were enriched in highly downregulated genes. The identified survival genes also contained multiple seed matches over their 3’ UTRs. That leaves little doubt that the CD95/CD95L shRNAs were hitting these genes through miRNA-like off-target activity. Once again, we see how siRNA off-target effects can impact experimental results. Though in this case, it actually helped identify relevant survival genes! Notably, siRNA off-target effects likely influence cell viability/proliferation data to a greater extent than other readouts since it is regulated by so many genes. This is not an isolated report of siRNA off-targeting in cancer. 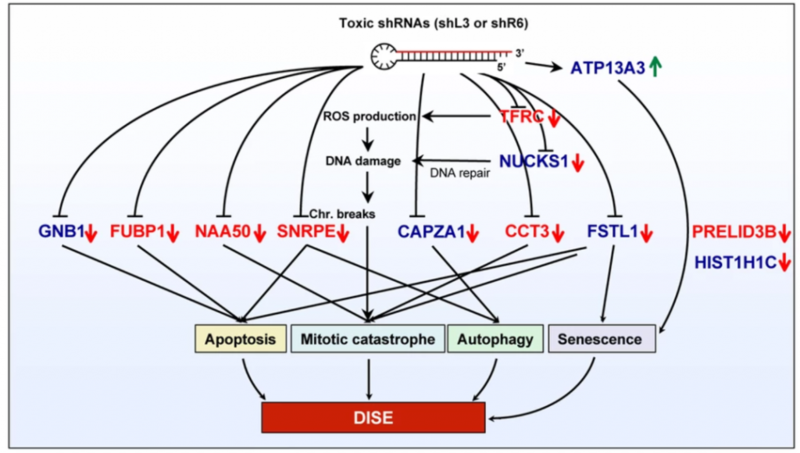 Targets such as STK33 and MELK, identified with RNAi to be important in cancer progression, failed to show the same effects in experiments performed by different groups or alternative techniques. The controversy continues however as their effects on cancer activity continue to be reported. siPOOLs were developed to avoid siRNA off-target effects through high complexity pooling and optimized design. Phenotypes are therefore more clearly and reliably ascribed to loss-of-function of the target gene. The new siPOOL Cancer Toolbox now provides cancer researchers the ability to disrupt multiple genes reliably, with reduced risk of siRNA off-targets, in an affordable toolkit solution. We scoured the published literature for the most highly cited genes involved in multiple forms of cancer. Choose your target genes from our list of top 100 cancer-associated genes to build your own siPOOL Cancer Toolbox. Notably, CD95, MELK and STK33 did not make the cut!